Home Entertainment #YHM written update 4th October 2018. #YHM written update 4th October 2018. 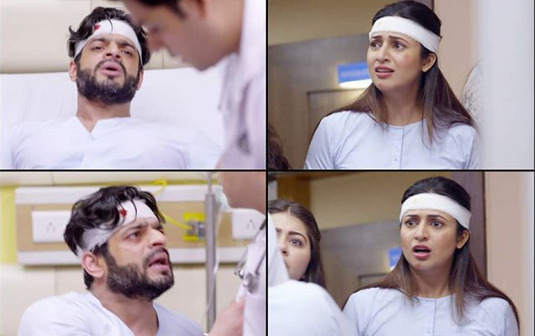 In the latest update of Yeh Hai Mohabbatein, 4th October 2018 Doctor said that Raman is paralysed. Today’s episode started with, the families were meet to Ishita and Raman as the latter is fine now. To listen this everyone was smiling. Romi also came to the hospital and meet to the family they all are seen emotional. Everyone was is in the sad mood. Romi comes to the hospital and he gets elated after learning that Simmi has come back and he asks a question to her that she tie him a Rakhi. To listen to this they both got emotional. Due to this Simmi was crying and she hugs Romi. Raman was panic as he is not able to move his leg and while he trying to call the nurse he falls from the bed. Raman was a shout in a very loud voice to call the nurse for his help. To listen to the voice of Raman that he shouts to help the hospital staff rushing for his help. They pick him up and the family also comes in. To see this everyone is shocked. They all get worried while the doctor does his check-up. He informs to the family of Raman that he is paralysed and he would not be able to walk again in his life. Raman starts shouting at everyone and asks them to leave the room. Ishita is oppressed after learning about Raman that he is paralysed and she cries to saw him in that bad condition. Ishita told to the family to be strong and that everything will soon be fine. Ishita also requested them to wait for the reports and be strong as Raman’s went through an emotional. Ishita puts up a strong act and promises to be brave for Raman. Simmi went to jail and meets Param, she shakes at him. Raman’s report turns out to be negative and the doctor informs that Raman might never be able to walk. Previous articleKulfi Kumar Bajewala written update of 4 October 2018.